I have not been the most consistent in taking these pictures. Last time I posted pictures of 13, 15, and 17 weeks. 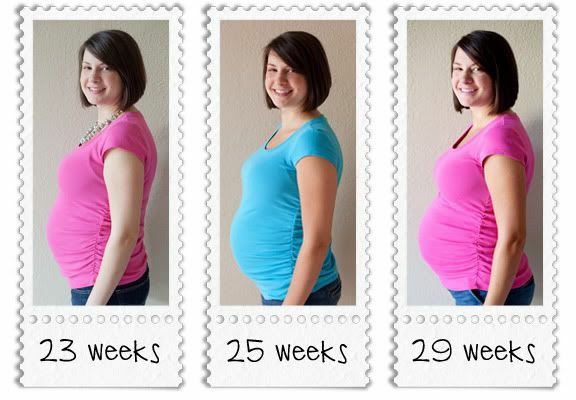 And the next picture we took was (as you can see) at 23 weeks. Sorry, Logan. I feel that second child syndrome is already appearing. And yes, I am wearing the same shirt in two of those photos. I can't remember what I wore yesterday, much less 2 (or 6) weeks ago. Just as it was with Ethan, I always feel that I can't possibly get any bigger, but considering I've got about 2 months left, that is a certainty. You are cute! Praying summer is gracious to you... My August 9th child was brutal to me with swelling! Live in the pool!! Rachel, you look fabulous!!! I know what you mean, I'm thinking... in TWO more months, I'll be HUGE!! !